A Moon That Lights Itself was commissioned by the Scottish National Galleries as part of the Inspiring Impressionism exhibition, focussing on the works of Charles François Daubigny, Claude Monet, and Vincent van Gogh. On September 16th 2016, Michael Begg (of Human Greed / Fovea Hex) performed the work, amidst the exhibition space, in the auspicious surroundings of the Royal Scottish Academy situated on the Mound in Edinburgh. Drawing on the works of French landscape artist Charles François Daubigny, Begg's commission was described as a "work for electronics, strings and moonlight". I must confess that of the three artists featured in the exhibition I wasn't at all familiar with Daubigny. 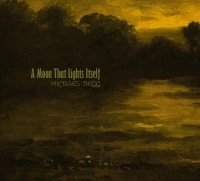 Consider Begg's work with Human Greed where their first release Consolation featured a moonface in Deryk Thomas's artwork on the cover; Black Hill: Midnight At The Blighted Star, the title of a later album which included 'Dalkeith Night' speaks for itself; and even Dirt On Earth featured a blackened nightscape on the cover it's perhaps particularly apt that Begg focusses on Daubigny's later work and specifically the twilight and nocturnal scenes of his later years, from which he painted while ensconced on a studio boat on the Oise. A Moon That Lights Itself is set in the context of mid to late 19th century France, and the cusp of impressionism, modernism, together with the earliest known sound recordings by Edouard-Lean Scott de Martinville and his phonautograph invention. A Moon That Lights Itself moves from dusk to dawn in the course of its 9 tracks. From tranquil drones overlaid with tumbling piano notes and solemn cello movements the opening track 'Le Crepuscule' moves into drifting drones before 'Moonrise' which like many of the tracks on A Moon That Lights Itself blends location recordings into the compositions. Here water in the form of lapping waves and crashing waves, bird chatter and the quack of ducks - ducks were a recurring motif within Daubigny's impressionist landscapes - are found amidst passages of glistening drone and moments of sombre piano and cello swell. Still and serene, glinting flourishes merge with stirring movements, its lapping waves resembling the tidal pull, and backward spinning electronics. 'Moonlight' bathes in the glow of light glistening sound textures set against deep reverberating rumbles and piercing glassy shrieks. Bells ring out before it moves into quieter echoed atmospherics. Daubigny often painted from his floating studio on a boat on the River Oise, and 'Le Bottin' aptly illustrates this with watery ripples dappled with tender piano notes and broader sound shudders, flowing into an end section comprising elegiac strings and melancholic synths. With its rippling metallic sounds, harsher noise elements and sluggish voice recordings 'The Birth Of Modernism' is much more abstract in composition. Those voices, taken from the 1860 phonautograms of Édouard-Léon Scott de Martinville, like modernism are almost blown in on a wind like drone. Scott de Martinville's recordings, sensitively mixed as another layer of sound here, were never intended for playback but recent research managed to transform these into playable sound files, discovering a male voice, probably of Scott de Martinville, singing a partial segment of the French folk song 'Au clair de la lune', which fits nicely here as in English it translates to 'In the Moonlight'. Elsewhere on 'The Birth Of Modernism' voices and bird calls are rendered as electronic squiggles, reflecting the movement away from realism to abstraction, perhaps. Begg returns to his palette of location sounds on 'Daubigny's Reverie' where lapping water and duck quack augment the shimmering sound spans. The drone filled atmospherics create a sense of melancholy; a captivating dreamspace only broken by the call and sing of birds in flight. Those flying birds could be seen as sound metaphor for the transition from Daubigny's impressionism to a new world of abstract representations, something furthered on 'Between Two Movements' which unfurls to a two pronged approach where undulating drones and glassy shrill frequencies are cast against evocative classical strings. It could even be electronics, Begg has an uncanny ability to sidestep the listener with his use of instrumentation that sound like something else. 'A Last Dance Under The Moon' moves to doleful cello sweeps and forlorn nocturnal electronics, achieving a graceful and mournful presence, largely due to the Clea Friend's cello score. A Moon That Lights Itself closes with the arrival of 'Dawn', a classy ensemble piece of piano score and cello, contrasting sombre cello movements with more optimistic and joyful piano notes, and as the sounds coalesce it seems to herald the new whilst paying homage to the past.